Founded in 2006, our initial goal was to provide science-based restoration plan development and consulting. As clients requested assistance with implementing restoration plans, Adaptive Restoration expanded to provide on-the-ground ecological restoration services. This included land stewardship, prairie establishment and maintenance, invasive species management, ecological surveys and inventories, outreach and education, and forestry. In 2009, we acquired BioLogic Environmental Consulting LLC, furthering our ability to provide restoration services. Our team has decades of experience and training in natural areas management, and we have graduate-level expertise in environmental science, agroecology, and forestry. We share a commitment to working hard, improving the land, and advancing the science and practice of ecological restoration, land stewardship and forestry. Hidden in this photo is our headquarters, nestled in the hills, prairies, savanna, and woodlands of Springdale Township, Dane County, Wisconsin, about 20 miles from Madison. Long ago, a fellow business owner shared one of the secrets of her success. “You can’t manage it if you don’t measure it,” she said. Although this concept isn’t new or the end-all of business management, measurement of our business operations, of our restoration results, and of our effect on the planet are all very important to us. Measurement and observation are also central to the scientific method, and to addressing the unknowns of this world. How could we develop hypotheses without first conducting a little observation? We believe observation and measurement are not just key aspects of tracking restoration progress, but should also be used to help guide future restoration decisions. In this sense, careful measurement allows us to “adapt” our restoration actions to the unknowns and unique components of your project. We’re a new company, and we are still trying to sort out what it means to be science-based, but here are a few guiding principles that we’ve been using. When possible or relevant, incorporate the scientific method into business operations and services. Stay current on the scientific literature in our field, and incorporate new information and processes into our operations. Participate in and attend scientific meetings related to restoration, forestry, wetlands, invasive species, and other areas where we claim “expertise”. Maintain a culture of innovation, thoughtful inquisition, and results-based decision making. As lead ecologist, Mike plans and implements our restoration projects, from prescribed burns to native plant establishment. Additionally, he conducts native plant surveys, ecological assessments and wetland delineations. Prior to moving to Wisconsin, Mike served for five years as the Naturalist for the Northern Virginia Regional Park Authority (NVRPA), where he helped manage a 67-acre park and planned and presented educational programs for over 10,000 visitors each year. Mike also brings experience in water resource management, from his work monitoring and mapping hundreds of miles of streams and rivers with the Connecticut Department of Environmental Protection and the Pennsylvania-based Alliance for Aquatic Resource Monitoring. Mike holds a M.S. in Environment and Resources from the University of Wisconsin-Madison and a B.S. in Environmental Science and Biology from Dickinson College. His graduate research focused on wetland restoration, native plant establishment and invasive species management. This work is published in Restoration Ecology, Invasive Plant Science and Management, and the Natural Areas Journal. Mike has over a decade of prescribed fire experience and his wildland firefighter training includes completion of The Nature Conservancy's Crew Boss and Engine Boss Academies. Luke's path to forestry and land management has not been a direct one, but always circled back to his roots growing up on a small, organic dairy farm. Luke served as an agriculture extension volunteer in the Peace Corps in Guatemala after undergraduate studies at St. Olaf College. Upon return to Wisconsin, he worked with a fledgling forest landowner cooperative, before running a horse logging and land management business based on his family farm for more than three years. Luke then completed graduate studies, and additional coursework in forestry at UW-Madison, where he holds a M.S. in Forestry. Luke has since worked in numerous capacities dealing with the invasion of the emerald ash borer (EAB), as a forest resource and economics analyst, and as a forest products utilization and marketing specialist. Luke loves to hug wood, cut wood and build stuff out of wood. As his hairline recedes, Luke has learned to love learning about other things that happen to be around wood, such as grass (prairies), weeds (invasives), and dirt (soil). Hikes with his wife Sarah and daughters, Thea and Camille, are often delayed stooping over some plant or staring up at the canopy. Luke is especially interested in the social, economic and landscape effects of changing land ownership patterns. His work emphasizes creative solutions to implement restorative forestry practices. 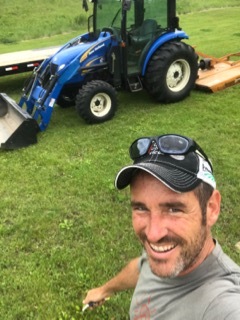 Luke is a Wisconsin Department of Natural Resources cooperating forester, a certified Managed Forest Law (MFL) plan writer, a NRCS Technical Service Provider (TSP) and a chainsaw safety instructor certified by the Safety and Woods Worker (SAWW) training organization. Stacey grew up in Simsbury, Connecticut and went to college at Colgate University (B.A. Biology). While in college, Stacey spent a summer studying field ecology at the University of Montana Flathead Lake Biological Station; an experience that fueled her love for the great outdoors. After graduating from Colgate, Stacey worked on a number of organic produce farms before heading to University of Wisconsin-Madison to pursue graduate research in Agroecology (agriculture in a socio-economic and environmental context). 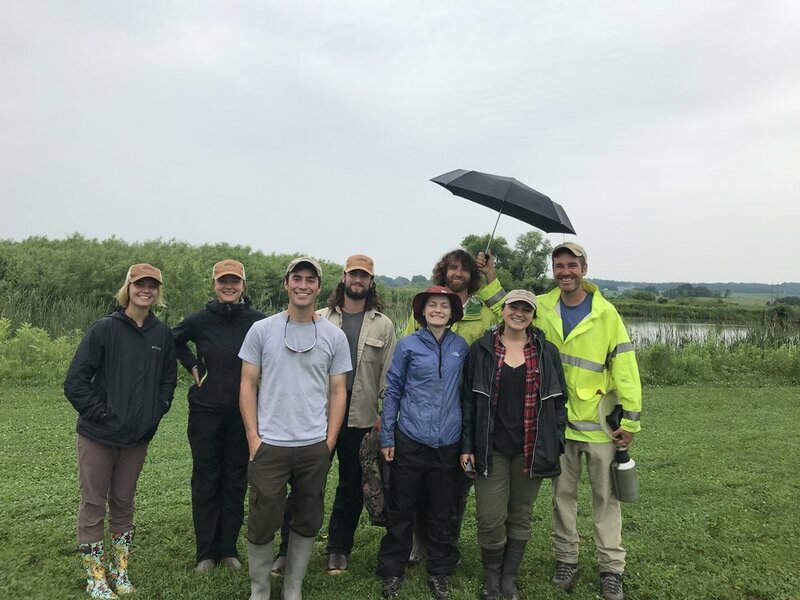 After getting her M.S., Stacey worked as an Associate Research Specialist for the UW-Madison Agronomy Department where she focused on weed and invasive species management. This work included coordinating field trials, data collection, and analysis of intercropping, weed management and runoff mitigation experiments. Jointly she worked with the Tallgrass Prairie and Oak Savanna Fire Science Consortium, investigating the effects of prescribed burning on invasive species in the Midwest. Stacey currently serves as a Board Member on the Wisconsin Prescribed Fire Council. Stacey is fascinated by the intersection of human land use and the environment. When not working, Stacey is found running, biking, and cross-country skiing through Wisconsin’s natural areas. A Madison, Wisconsin native, Mike always enjoyed the outdoors and from a very young age, loved fire. Mike began his career in wildland fire with the United States Forest Service in the Carson National Forest. After a couple of years working with the Carson Hotshots in New Mexico, Mike took a position as an Engine Crew Member and Senior Firefighter at the Arapaho-Roosevelt National Forest, Boulder Ranger District in Colorado. With years of experience in wildland fire under his belt, Mike returned to Wisconsin in 2008 and took a position with the United States Fish and Wildlife Service, first at the Leopold Wetland Management District and then at the Necedah National Wildlife Refuge. These positions provided him significant experience with prescribed fire and the process of restoration. In fall 2014, he started with Adaptive Restoration. Mike brings with him a great deal of wildland and prescribed fire knowledge. He is a skilled sawyer. Mike is dedicated to the principles of restoration ecology and truly enjoys contributing to the process of returning the land back to the way it once was. When he is not working, Mike’s passion for the outdoors is apparent; he can be found camping, hiking, canoeing, and cross country skiing with his wife, Laura, and his dog, Murphy. Bryant grew up on a small hobby farm in southern Wisconsin where he spent a lot of time outdoors and grew interested in hunting and wildlife. He studied wildlife ecology at the College of Natural Resources at University of Wisconsin-Stevens Point and holds a B.S. in Conservation Biology and Zoology from University of Wisconsin-Madison. His previous experience includes interning with the Empire-Sauk Chapter of The Prairie Enthusiasts where he restored and maintained high-quality prairies and oak savannas. This helped him to better appreciate Wisconsin's native flora, fauna, and habitats in general and increased his interest in the field of habitat restoration. Bryant started with Adaptive Restoration as an seasonal intern and worked his way up to managing restoration and wildlife habitat on several hundred acres. These lands include prairie remnants, restored prairies, savanna, wetlands and woodlands. In his free time Bryant enjoys hunting, hiking, reading, fishing and birding. Chris’ love of Wisconsin’s incredible outdoors began at a young age. He first became interested in ecology and restoration work while learning from his grandfather in the North Woods. His interest grew while attending and working at a camp in the North Woods where he helped design and teach an environmental education program. Thanks to these experiences at a young age Chris majored in Environmental Studies while at UW-Madison. A summer internship with the Madison Audubon Society at Faville Grove Sanctuary in Lake Mills led him to realize that his passion for the outdoors was best fed by the hands-on work that restoration ecology, prescribed burning, and forest management offers. When not at work, you’ll most likely to find Chris on the water fishing, camping, discovering new food, and playing his bass or guitar. Brad comes to Adaptive Restoration following eight years as a Wildlife Biologist for the Florida Fish and Wildlife Conservation Commission (FWC). As an FWC biologist, Brad learned land management skills including wildlife identification and survey methodology, herbicide application, tree cutting, and prescribed fire. Brad graduated from Florida Gulf Coast University with a B.A. In Environmental Studies, and a minor in Biology. He lives in Mt. Horeb with his wife, Christine, and their two cats, Puddles and Cookie. When not pestering his coworkers with tales of "how we used to do things in Florida...," he enjoys fishing, drawing, and walking through the woods with binoculars, field guide, and notebook at the ready. Kate is a Madison Wisconsin native. Her love for nature and the outdoors began at an early age while gardening with her Father and getting lost in the woods with her brother until sunset in the summers. Kate graduated from the University of Wisconsin - Stout with a degree in Environmental Science with a concentration in Plant Science and a minor in Sustainability. Her passion for plants and the outdoors continued to grow through her experiences working as the manager for UW-Stout's campus garden, an internship with the non-profit urban farm, Growing Power, and through an internship with Herb Pharm in Oregon to learn about herbal medicine. In her free time Kate enjoys cooking with good ingredients, spending time with her hands in the dirt gardening, continuing to learn about herbal medicine and the power of plants, hiking and experiencing Wisconsin's natural beauty, and engaging her creative side through pen & ink drawings- all alongside good people and good friends. Bryce joins the team as a recent graduate of UW-Madison with a B.S. in Geology and a degree in Environmental Studies. During his time at UW Bryce stayed busy as a member of the Badger Hunting Club, the Undergraduate Geology Club, and the UW Club Wrestling team. Bryce is a Wisconsin native, growing up in central sands before moving to Madison for school. The past few years have taken him other places though, as he spent 4 months in Alaska working on a backcountry trail maintenance crew, 9 weeks studying rocks and exploring Utah and Colorado, and a few weeks looking at rocks in Ontario, Canada. In his free time, you can find Bryce on the water or in the woods. He enjoys wilderness paddling trips, hunting, fishing, biking, and backpacking. The further from roads, the better. Ready to get your project started? Want to join our team? Feel free to contact us.